Mangaluru: Former MLA J R Lobo urged the City Commissioner of Police to initiate stern action against those who posted a distasteful audio clip on social media against former Union minister B Janardhana Poojary. “Following Poojary’s statement in support of construction of the Ram Mandir on December 2, an audio clipping was uploaded on the social media against him. The clipping even demanded an encounter against Poojary, calling him a traitor,” said Lobo. He added that the message was the outcome of a hidden agenda to create tension in society. 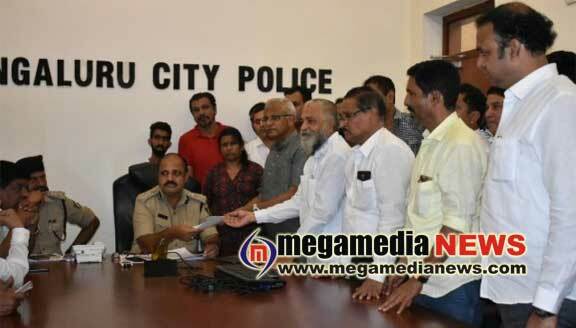 A memorandum was submitted to Commissioner T R Suresh. Recently, a message declaring Poojary to be terminally ill had also gone viral on social media. A detailed investigation should be initiated, the memorandum demanded. Vishwa Hindu Parishat (VHP) and Bajrang Dal members welcomed Poojary’s statement in favour of temple construction and condemned the threats issued to Poojary. VHP zonal secretary Sharan Pumpwell said Poojary, a senior leader, had every right to air his views on the Ayodhya Ram Mandir. “But, some miscreants were posing open threats to Poojary, which should be condemned. This is an act of Jehadi mindset. Threatening a national leader is an act of sedition,” Pumpwell said and urged the Police Department to initiate strict legal action against the wrongdoers.